180 mm/57 MK-3-1803 х 3 pcs. Initial HE Shell Velocity920 m./s. Initial AP Shell Velocity920 m./s. 45 mm 21-K6 х 1 pcs. 37 mm 70-K8 х 1 pcs. Molotov — Soviet premium Tier VI cruiser. An improvement of the preceding Project-26 cruisers, also known as the Kirov-class cruisers, the Project-26bis "sub-class" had improvements in armour protection, while retaining the powerful armaments and high speed set as standard of the class. Molotov was first released for sale worldwide on 16 May 2016. 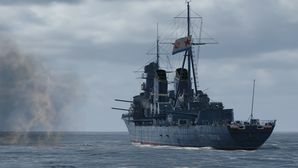 Molotov superficially resembles the Tier V soviet cruiser Kirov, and both ships do share many similar characteristics. Both have paper armor and cannot be relied upon to tank damage when found in unfavourable situations. Both have an average anti-aircraft suite, which could provide mediocre self-defence from aviation, at best. Furthermore, both cruisers exhibit good speed, which gives them the legs to move between destinations, but the large turning radius hampers any sense of maneuverability. The most notable trait of Molotov are the primary artillery. While they are the same rifles mounted on Kirov, Molotov has improved ballistic characteristics than its Tier V predecessor; the ballistic characteristics are more similar to those of Tier IX Russian cruiser Dmitri Donskoi. Specifically, she has good fire chance, good AP alpha damage, and good shell velocity. This allows her to reliably hit any straight-sailing ship at any distance; even nailing citadels against broadside cruisers. As well, she has the volume of fire to deter any destroyer that gets too close, and harass any battleship that has over-extended. Molotov is a reliable secondary line support gunship that can provide effective counter-fire from the rear of an advancing flank, while the primary line ships are keeping the enemy ships busy, but this task is not easy. Captains will need to have mastered good map/situational awareness and a decent sense of pre-planning to understand where to position their Molotov; this can spell the difference between a feared gunship and a target for the enemy. Great speed of 36 knots. Fantastic gun handling characteristics and shell performance. Responsive rudder for a cruiser. Fragile cruiser with light armor. Secondary and Torpedo armament are too short-ranged to be effective. Has a large turning radius. As a Premium ship, Molotov doesn't have any upgrades to research. Captains are recommended to take Premium versions of all consumables, but it is not a necessity. Furthermore, the a choice between Hydroacoustic Search ( ) and Defensive AA Fire ( ) will predominantly fall upon the captain’s preferred play-style, as both only confer situational benefit at best. As a Premium ship, Molotov comes included with Type 10 camouflage that lowers her detection radius, reduces the accuracy of incoming shells, reduces her repair costs, and increases the amount of experience she earns. The choice of which signal flags to mount will confer to the individual preference of each captain, and are subject to great variation, although, some options will be highlighted. If captains wish to buff their primary artillery, they are encouraged to mount Victor Lima ( ) and India X-Ray ( ) to increase fire chance to HE shells, which will synergize well with Demolition Expert. Captains should mount India Yankee ( ) to decrease time to extinguish fires, November Foxtrot ( ) to decrease reload time of consumables, and Sierra Mike ( ) to increase Molotov’s maximum speed. Molotov is one of the two ships of the Project-26bis cruisers, themselves an upgraded version of the similar Project-26 cruisers; the first light cruisers designed by the still new Soviet Navy. The country, still mostly incapable of designing and building such large capital ships, sought foreign help. With the cooperation of the Italian Navy, the Soviets used the plans for the modern Raimondo Montecuccoli-class cruisers and the machinery plans of the later Duca d’Aosta-class cruisers in designing and building the Project-26 ships. With construction of Kirov and Voroshilov underway, Soviet designers sought to update the design in order to keep the class competitive with rival navies, and more so to attempt to build the new ships without foreign influence. Project-26bis cruisers had a newly designed forward superstructure, as sea trials proved that the previous design would conduct hull vibrations all the way up to where the fire-directing equipment was. A central-core design replaced the 4-legged design, which not only buffered the vibrations, but also improved the firing arcs of some of the Anti-aircraft weaponry, along with the superstructure change; the ships were given the latest fire-control systems, and Molotov in particular was the first Soviet ship to mount radar. Armor improvement was another aspect of the design update. Being light cruisers, the armor would never be a strong suit, but being of an early 1930s design, the armor on the Project-26 cruisers was exceptionally light. To rectify this deficiency, the Project-26bis cruisers had improved belt armor, improved bulkhead armor, and as well as improved barbette armor of the internal turret infrastructure. The Project-26bis cruisers were larger than their predecessors, having a larger draft and a double bottom hull; an arrangement that allowed for increased range. Coupled with an all-native power plant that could generate more power than before – about 16,000 shaft horsepower more – resulting in a trial speed very close to the design specifications of 37 knots, despite an increase of displacement of an approximate 300 tons. Molotov was laid down at the Marti South, Nikolayev on 14 January 1937, and launched on 4 December 1939. After her sea trials, she was commissioned into the Navy on 14 June 1941. Commissioned only months before the start of Operation Barbarossa, from the onset, Molotov's wartime career would involve supporting the ground troops and the fighting around the Crimean peninsula. Due to her being one of the few Soviet ships that carried radar set, she was instrumental in the defense of Sevastopol and later Tuapse; she provided critical early air warning for the defenders of both cities. In November of 1941 she was relocated to Feodosia to bombard the ongoing German assault, and in December, she returned to Sevastopol to unload the 386th Rifle Brigade, and pick up wounded and refugees from the beleaguered city; the first months a reflection of the roles she will continue to play. 1942 commenced with Molotov assigned to bombardment duties in Feodosia and later the Kerch Peninsula to blunt the continued German offensives in those regions. Later during the spring and summer, Molotov made frequent trips to-and-from Sevastopol: unloading troops and picking up wounded. Her wartime contributions came to a halt when in August of 1942, her stern was blown off by torpedo bombers; the damage so severe she had to cannibalize parts from incomplete ships. With continued mounting losses to the Soviet Navy, Joseph Stalin forbade deployment of large capital warships unless absolutely necessary. Her postwar career commenced with the completion of her repair work of the damage she sustained during the war, and soon after was sent back for modernization in the early 1950s; she was refit with a plethora of different radar systems - along with improved AA guns and mounts - as she was assigned as a test-bed for the new radar gear. Her only action of note was her participation in the rescue of the crew of the battleship Novorossiysk after the latter exploded and sank. She spent the final years of her life as a training cruiser, until she was scrapped in 1972. This page was last modified on 19 February 2019, at 08:20. This page has been accessed 80,977 times.